In February 2011, mass protests began in Bahrain, calling for reform and rights. The monarchy responded with force and arrests to suppress the demonstrations, backed by a Saudi military intervention in March. The tactics succeeded in breaking up large gatherings, as human rights activists were given sentences including life in prison — a notable example is Abdulhadi al-Khawaja, the co-founder of the Bahrain Centre for Human Rights — others were repeatedly detained and warned against dissent, and more than 80 people were killed by security forces. The head of the official opposition party al-Wefaq, Sheikh Ali Salman, was given a four-year prison sentence in June 2015. Small protests continue in Bahrain’s villages, but attention has long moved away from the kingdom, with little sign of a change in the political and social situation. The island is superficially quieter than it was two years ago. Arrests and loss of citizenship, a punishment that leaves the recipient free but without the means either to leave or to support himself, have been far more effective at quelling street demonstrations than beatings, which have diminished. There are still small protests in the villages, but the big demonstrations of two or three years ago are largely over. Yet, if the government has won this round, little is settled. Communal bitterness runs deep on both sides of the Sunni-Shia divide; positions have hardened. Leadership on all sides is divided and hampered by a lack of intentions, while all around this small island the chaos is rising: in Iraq, Syria and Yemen where the situation is deeply relevant to perceptions within Bahrain. The U.S. government is trying to manage the worst consequences of a situation it can do little to influence. It is viewed negatively in Bahrain and has an almost overwhelming number of regional-security issues to preoccupy its policy attention. On November 22 and 29, 2014, Bahrain held two rounds of an election for its reformed Parliament. With districts reorganized, the reserved Shia seats in the lower house fell from 18 to 17 (out of 40), a step backward. The government and royal court urged the largest Shia party, al-Wefaq, to participate. Its leadership tried to bargain for concessions, arguing that this was essential to show their followers why they should participate. The government refused, and al-Wefaq boycotted. The boycott effort was marked by threats and even some violence against Shia who chose to participate in the elections. Nevertheless, the electoral turnout was somewhere above 50 percent, down slightly from 67 percent in the previous election but still quite respectable. It appears to me that the boycott decision was a substantial failure. 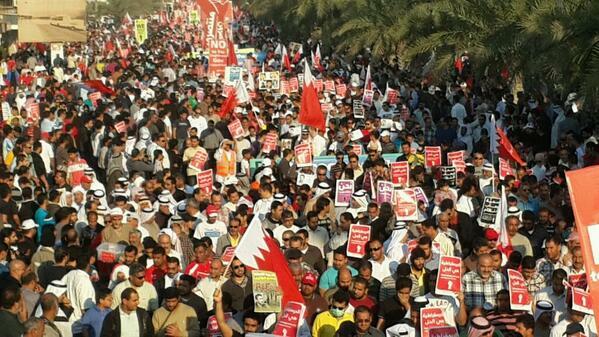 Foreign embassies and the Bahraini government had urged al-Wefaq to participate. The violence, whether directed by al-Wefaq or simply carried out in its name, hurt its claim to be a representative and democratic organization, and the substantial turnout in the face of threats was a loss for the party. The government subsequently moved against al-Wefaq and imprisoned many of its leaders; others have fled into exile, and only two remain free. Al-Wefaq is now in a worse position with less influence, less control of matters in the street, and less ability to maneuver than before. This result is, unfortunately, reminiscent of the party’s decision to reject negotiations in March 2011 and, later, to demand procedural concessions before starting to discuss substance in the long-running “dialogue” of last year. For each decision there were, perhaps, good reasons. But in each case, the party — either because it overestimated its strength or because it feared criticism from its more radical elements — made decisions that left it weaker. A leadership that continually makes the wrong political call has a problem, no matter how noble its motives may be. The chances of the government’s offering a political deal or solution have gone down. The turnout in the election and the successful suppression of violence give the government the sense that concessions are not needed. Al-Wefaq’s refusal to stand for election was resented by the government and has made it more convinced than ever that the party cannot make a political deal. Whether al-Wefaq is a truly democratic party and whether it could sustain a political compromise if one were struck remain important, but unanswered, questions. The party is sectarian, and the leaders of the Shia community are religious. Would the party’s ultimate decisions be made by votes or by religious fiat? Since the issue has never been tested, it remains ripe for suspicion. The answer, when I posed the question, was that the party was separate from the religious leadership but, of course, pious Shia will look to their religious leaders for guidance. I asked al-Wefaq leaders whether they would be able to sustain a deal if their more radical fringe attacked it. Would they stand with the government to sustain it? I found no clear response. The hypothetical question was perhaps unfair, given all the pressures on them at the moment. Yet, if al-Wefaq’s leaders cannot clearly state a willingness to keep a bargain if one were reached, there is little incentive for the government to make concessions. There are also smaller Shia parties outside al-Wefaq including several more radical ones that have been banned. As they compete with al-Wefaq for leadership of an increasingly bitter constituency, one cannot help but be sympathetic to the position in which al-Wefaq’s leaders find themselves; but that does not meet the political need for clarity. The Sunni community appears to have deepened its own fears and solidarity. Although I cannot validate it, I was told that attitudes in Sunni villages were the mirror image of those in Shia villages: hostile, angry and unwilling to compromise. Little academic research and even less journalistic coverage has assessed Sunni attitudes. This is regrettable; whether they are 30 percent (an extreme Shia claim) or 45 percent, the Sunni are a substantial part of the population, and their ranks have been increased by naturalization. Broad tendencies in the Sunni electorate are mixed. On the one hand, most representatives of the Islamic societies lost their seats in the 2014 election. This would suggest that some in the community are growing tired of the religious posturing. On the other hand, there are growing Salafi and extreme tendencies; Bahrainis are beginning to turn up in the ranks of the Islamic State (ISIS). How big, how virulent, or how difficult to control the Sunni population would be if it felt its position jeopardized by concessions to the Shia is a matter of speculation. Further, there are divisions within the Sunni community in addition to the radical fringe. A movement called the Al-Fattah Youth Coalition has broken away from the main National Unity Group and put forth its own call for political reform. Some of its positions, particularly against government corruption, overlap with other calls for reform. It is unclear how strong this faction is, but it is clear that not all Sunni political voices are echoes of the government. The Sunni factor is present and may well constrain the room for compromise if one were ever in the offing. There is also a clear need for more systematic study of this part of the population. If Shia parties lack an articulated vision of how to exit from Bahrain’s troubles, positions within the government are no clearer. One view, which for the moment seems to have the upper hand, is simply to grind the opposition down until it retreats. Many believe there is no other choice. They are convinced that outside hands, particularly Iranian and local religious leaders, are really determined on the overthrow of the ruling family and would simply use any concessions as a sign of weakness that would encourage new demands. Those holding such views may also see the present problems as part of a cycle of disturbances that have erupted periodically since the 1920s. Each previous cycle, with the exception of King Hamad’s reforms in 2001, have been put down by force, so why not this one? A Way Forward with a Divided Monarchy? While the government certainly has the power to maintain itself, my own belief is that force alone will not provide a solution. There is too much bitterness, too many in prison, and too much outside support from human-rights groups for the problem to just fade away. Also, the interconnection of internal and external views and news through the Internet present too many new ways to keep grievances alive to be totally crushed. Others hold somewhat different views on eventual reform but agree that no resolution through a one-time deal is possible. In this alternative view, what is essential is to gradually empower multiple elements in Bahraini society, including new leaders and civil society. The electoral cycle needs to be maintained to continue offering an escape route. One element of the gradualist way forward is to make progress on the social and economic issues that help fuel the protests. New social programs, expanded housing for the marginalized and new job opportunities are key parts of this approach. Unfortunately, while some very ambitious programs have been announced, little actual movement is apparent. To date, the gradualist approach appears to be more theory than practice. Some speculate that differences within the royal family may hamper this approach; different groups are concerned that the success of an approach from the other group might expand their power. Thus, each works to undercut the other’s approaches. The factions are usually characterized as being organized around 1) Crown Prince Salman bin Hamad on the one hand and 2) his uncle, Prime Minister Sheikh Khalifa bin Salman al-Khalifa, head of armed forces Field Marshal Khalifa bin Ahmed al-Khalifa, and various close relatives. Much of the talk about the different factions is speculative, with stories of senior advisers fired and released in a power struggle that persists as a kind of low-level background noise. Whatever the reality, it does seem clear that the ruling family has not coalesced around a single view. However, the putative power struggle within the family is taking place in a threatening regional political environment among people with the discipline to keep tensions out of public view. This general sense of external threat is shared by several of the other Gulf monarchies, limiting any interest in risky political reforms. Additionally, there are long-standing issues of corruption and profiteering by individuals connected to the government and royal family. While it is not possible to know the truth of all these charges, there does not appear to be any forceful effort on the part of the government to clean house. This adds to doubt about its sincerity to undertake reforms on underlying social issues that feed discontent. Bahraini fear of Iran has always been strong, in the 30 years that I have dealt with Gulf issues, and never stronger than it is today. Iran maintained a formal claim to Bahrain until 1971. After the Iranian revolution, fears only intensified, sometimes nurtured by the discovery of arms shipments, apparently from Iran. Recent new captures of arms and explosives have been confirmed by U.S. officials, and the presumption of Iranian sourcing is strong. Old and essentially permanent fears of Iran are now vastly compounded by a view that I heard from members of both camps in the royal family: Iran will be free to devote new resources to subversion because of the recent nuclear deal with the United States and its international partners and the forthcoming lifting of sanctions. Perceived American weakness in Syria and Iraq, and President Obama’s reluctance to engage in military adventures have multiplied worries among Bahrain’s royal family and its Sunni supporters, and in the region more generally that the American alliance can no longer be trusted to protect the island. The relationship has been a cornerstone of Bahrain’s security architecture for 44 years, since the United States replaced the British in 1971. It is difficult for outsiders unfamiliar with this background to realize just how profoundly concerned leading Bahrainis feel when they no longer trust this pillar of security. Now the Islamic State has been added to the mix. Profoundly hostile to Iran, the Islamic State is equally hostile to Arab monarchies. Iran has already expanded its influence into near control of Iraq while locked in a fierce struggle with the equally threatening Islamic State in Syria. On the other side of the Arabian Peninsula (and curling around much of its base), Iranian, Islamic State and al-Qaeda forces are jockeying for position in Yemen against the coalition backed by Saudi Arabia and the UAE and supported by Bahrain. For Bahrain, the regional situation of both Shia and Sunni theological extremes (Islamo-fascism as one has dubbed it; religion justifying dictatorship) is more dangerous than ever — the Arab Spring revolts have altered long-dominant regional relations, and the United States is likely to be absent. Bahrain has sent small forces to join the fight in Yemen (including two of the king’s sons) and has supported the air campaign in Syria but is well aware that its small size renders these actions essentially symbolic. Unlike Americans, who tend to treat these different regional hotspots separately, for many in Bahrain’s royal family and its Sunni supporters, they are part of a threatening region that shows every prospect of continuing to be dangerous for many years. The result: to close the space for internal political deal-making. The negotiating terms that were briefly offered — and rejected by the Shia leaders — in 2011 would not be offered today. The Al Khalifas, whether moderates or hardliners, see too much danger of Iranian influence to risk significant concessions. They doubt the existence of a truly indigenous Shia leadership that could make a deal and maintain it. Above all, they see the regional situation as too dangerous for political experimentation. They are mystified as to why the United States does not share their concerns and their, to them, logical conclusions. These are neither in the pit of 2011, nor are they anything like as warm as in past years. American criticism of Bahrain’s human-rights issues continues, but at a lower volume. The United States is preoccupied with crises in Syria and Iraq. It needs Bahraini basing for aircraft and ships operating from the Gulf to the Arabian and Red Seas and the horn of Africa. It is scarcely going to provoke a confrontation with Saudi Arabia over Bahrain while the Saudis are deeply immersed in Yemen. Yet while the Obama Administration has lifted some arms-sale restrictions, it seems unable to find a public posture to explain its position. Is it still deeply critical of Bahrain on human rights and ready to push reform that Bahraini royals see as the route to overthrow? Or is it prepared to back more limited reforms that fall short of one-person-one vote democracy in a communally divided island? Is it a reliable security partner? The tension between U.S. democracy and human-rights goals on the one hand and very important security interests on the other is real. Both are long-term components of U.S. foreign policy. The problem is that the administration seems unable to provide a public explanation of how it intends to manage the tension going forward. Without such clarity, America is condemned on all sides. Shia activists and human-rights supporters see U.S. hypocrisy but keep hoping for more pressure on the Bahraini government. One result is that U.S. suggestions for compromise, such as urging al-Wefaq to enter the last elections, are ineffective. At the same time, the government sees an ally with whom its security has been intertwined as fickle and unreliable. Not trusting either U.S. strategic views or support for the Bahraini government it is unlikely to be moved by U.S. suasion to take any risks. For now, Bahrain is at an impasse. The Shia are repressed, a fair statement when an activist is sentenced to a year in jail for tearing up a picture of the king, and 179 Shia Muslims of Persian descent have had their citizenship revoked. But repression is now more sophisticated, less brutal, and less public. Shia community leaders remain unresponsive to charges of outside control, being unable either to publicly distance themselves from Iran or to show a separation between political and religious leadership. Al-Wefaq’s leadership is in jail, in exile or barely surviving in Bahrain. Their political decisions have left them weaker at every stage, while the anger among their Shia base seems to leave them less and less room to compromise. The result is a community able to maintain anger and defiance but unable to gain anything from it. A large portion of the Sunni community seems more politicized than ever before. There are some voices calling for reform, particularly against corruption, a call that can cross religious lines, but they seem fairly muted for the moment. They generally support the government in rejecting changes that would lead to Shia political dominance. At the same time, it is far from clear where Sunni support would lie in the event of political compromise with the Shia. And the Sunni community has its own radical and dangerous fringes. Indeed, there are some who argue that the government, although now concerned about the threat posed by the Islamic State, has for too long allowed these radical and fringe groups to increase relatively unhindered and has encouraged some Sunni chauvinism, perhaps viewing it as a necessary counterforce to Shia political influence. In short, the Sunni cannot be ignored, as most Western media has done in describing only an internal conflict between the Shia and the royal family. Within the royal family, the view has grown that there is no short-term solution possible. The threats are regarded as too numerous and too externally driven to permit risking a rapid resolution, even if one could be visualized. If the current impasse does not allow life to return to pre-2011 normal, neither does it threaten the royal family or Bahrain’s government. The island is too small, flat and contained for a serious insurgency; the governmental forces are too loyal, being a mix of Sunni Bahrainis and expatriates with no ties to the Shia; and Saudi support is too strong for opposition forces to mount a serious threat to regime stability. As external crises have proliferated, it is clear as well that the United States will not make significant demands. But the Bahraini government is neither moving toward a solution nor achieving progress in its announced plans to increase low-income housing to meeting social needs nor dealing with corruption among its supporters. So the situation grinds on, frequently ignored in the West as a footnote to the bloodier struggles of Iraq, Syria, and Yemen and the threats from the Islamic State. Anger and suspicion within Bahrain deepen their roots in each community, and the United States continues to look confused about its purposes and its plans.